We're well past the half-way point of April and, sad to say donation responses have been pitiful, if not nil. The sad truth is that we are down to serious crunch time. While other non-profits of the conciliar type are asking for hundreds of thousands of dollars or fifty thousand to help pay their salaries, all we're asking to meet the bills is $3,000. That's a pittance for many out there who pour that much into corrupt conciliar coffers every year, not realizing that those "good will" offerings go to cover up more sin and to perpetuate the "bad will" of the corrupt prelates set in place with Ratzinger's approval. Blood Money. Dirty Money! Is that what God wants? We know it's not. In fact, did you realize it's a sin to contribute to anything that does not go towards the salvation of souls? That's right, and the only way to salvation is through the sacramental graces of the true Church founded by Christ and adhered to from Saint Peter through Pope Pius XII. But you've heard that before and many just wave it off and say "so what," so numb to the devastation that the counterfeit church of conciliarism, spawned at Vatican II, has rendered. The sad fact is that at each's Particular Judgment our Lord will ask: "What did you do to feed My lambs?" What will be your answer when He waves off your litany of humanistic organizations you contributed to? such as your local conciliar lodge, United Way, Red Cross, Unicef, RCIA, USCCB Drives, Catholic Charities, and other organizations. Even the once Catholic Knights of Columbus have no intention of restablishing the Social Kingship of Christ? That last may sound severe, but having been a Fourth Degree Knight I can flatly state without fear of reprisal that the Knights of Columbus, under the political leadership of Carl Anderson, have abandoned the principles, ideals and function founder Father Michael McGivney intended. 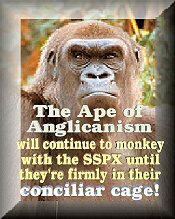 While Anderson et al clamor to see McGivney canonized in the saint factory that is conciliar con, do they realize that Fr. McGivney would have vehemently opposed the counterfeit church that the KC pander to? Yes, he would as should every Knight if they truly take their degrees seriously. But that would be politically incorrect and that is why the only difference between the Knights and Masons today is the insignia. They both have similar lodges. Look it up if you don't believe me. But I digress. SANCTUS finances have dried up and The Daily Catholic is literally on life-support. If we do not meet our goal there will be no more daily issues. That's the bottom line. We had thought we would be able to raise $5,000 for 2008 by now, but donations have been way, way, way, way, down. Blame it on the recession or blame it on lukewarmness, the fact of the matter is if we don't raise a minimum of $3,000. there'll be no more daily issues after May 3 and we'll remain in hiatus mode for the rest of the year. If that is what you really want, then you'll continue to ignore our plea. We can lead a horse to water, but we cannot make the animal drink. So also we can teach and convey the truth, but we can't force you to believe. That takes grace, which we pray souls will attain each and every day. You know the bottom line. Do you also know the bottom line is that when push comes to shove God will hold those who held back accountable? For our update in this third edition of our Easter Hiatus Issue, we provide above and below us here down the side column the Propers of each Holy Sacrifice of the Mass from April 20 through the end of April. Those who want to plan ahead, we've left the first three days of May available for previewing through the Feast of the Finding of the True Cross on the First Saturday of May. We've provided some excellent traditional sites to keep you abreast of the most recent events including the latest pertinent articles by Dr. Thomas Droleskey and keeping up on the ballyhoo facade and papolotry so evident with BeneRatz' visit to the East Coast and his sell out of the Catholic Faith so manifest. His most recent articles on this are directly to the right. For two other excellent sites to keep tabs on what's really going on beneath the media veneer, we recommend Traditio.com and TraditionInAction.org where Atila Guimaraes and Dr. Marian Horvat continue to expose the heresies of Ratzinger and the conciliar church. We've placed John Gregory's contribution of bringing readers the orthodox commentaries of Fr. George Leo Haydock in the column below under the respective Sunday as you scroll down. Profiles on Doctors of the Church still to come can also be found by scrolling down in the column below under their respective feasts of April 21 and May 2. For now we continue to highlight in the center column Griff Ruby's article Sleight of Hand because of its importance, especially during this time when Ratzinger has wowed so many clueless Americans, especially the mainstream media in their abulia, with his sleight of hand in his continuing magical act of making the True Faith disappear. This is only too evident in our archives in each issue thus far as well as our monthly features pages for several years and our Ports of Call page that lists every issue ever published which incorporates over 35,000 pages on line. So that should keep anyone busy for days, weeks, even months. So you see, we will never leave you short of resources. As far as returning to new material each day, well, that is contingent on how important that is to readers by their generous hearts in giving so this apostolate can stay afloat. We had a problem with the link but have alleviated that by linking to a page without codes so you can access PayPal with total security. If you tried before and couldn't connect, please reconsider and try again. After having it fixed, we have received only two donations and those from benefactors who have given before. We remind you: Without your donations, we are forced to spend time on other projects that will generate revenue to keep bread on the table and a roof over our heads, not to mention the expenses of keeping The Daily Catholic going. If we do not raise $3,000. by the end of April, The Daily Catholic will become a resource site permanently. You can click on the donate button immediately below if you can find it in your heart to help this ministry in this dire time. And, once again we remind you that if you have not yet included The Daily Catholic on your charitable list, we pray you will and remember this traditional, uncompromising ministry in wills as well. We thank you in advance for helping us help others to "KNOW THEIR FAITH in order to KEEP THEIR FAITH." God bless and keep during this Time of Paschaltide. Alleluia, alleluia. We are also pleased to inform readers that Tom has finally been able to work out the glitches that delayed his audio/video lectures on line. You can now find out more at Christ or Chaos Store Instructions. We can't recommend this enough and know that the more senses one uses such as sight and sound, the more of an impact his words should have on the faithful, especially those who have had such a difficult time connecting the dots.